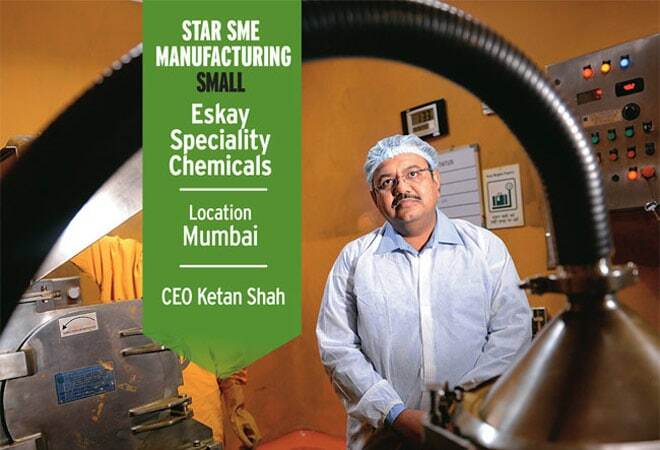 Ketan Shah, CEO of Eskay Speciality Chemicals. Photo: Shailesh Rawal. The Rs 600-crore SK Group, of which Eskay Speciality Chemicals is a part, has never roped in any investors from outside the founding Shah family. This is because whenever one part of the business requires money other units chip in, says Ketan Shah, CEO of Eskay Speciality and one of seven cousins who run the group. Eskay Speciality was set up in 2006 and makes niche chemicals that are used in the making of ointments and medicines. VIDEO:What makes Eskay Speciality Chemicals stand out The company, which posted revenue of Rs 45 crore in 2013/14, has grown about 35 per cent annually over the past two years. That pace will be difficult to maintain as the company grows, says Shah, who is looking at a more realistic 22 per cent to 25 per cent. The company gets nearly 80 per cent of its revenue from exports, mainly to the US and Europe. Shah says the company has about 25 customers, including the likes of Sanofi, Procter & Gamble, and Novartis. Clients vouch for the company. Pradeep Thakur, who heads the India sourcing arm of US-based pharmaceuticals and chemicals company Aceto, has been an Eskay customer for more than decade. He says the company is profit-oriented but doesn't try to exploit customers who are bound by tough regulatory concerns. Eskay also looks after the interests of its customers, he says, adding: "We have never lost business because of [Eskay's] greed."